The Secret to Productivity and Profit for Your Chocolate Business - Tomric Systems, Inc.
Decades of experience has given us a lot of insight into the day-to-day challenges you face in the chocolate business. It is a career that requires you to push the limits of dedication, creativity, artistic ability, and consistency. Chocolate makers that thrive in this industry are the ones that can maintain their originality with a high-quality product. They also need to be able to conquer the obstacles of scaling an efficient business. Everything from initial concept and ingredients, to production and distribution, is as crucial as the next. Sharon Terenzi, the creator of TheChocolateJournalist.com, is a chocolate blogger that reports the latest trends in the chocolate industry from around the world. She uses her platform to shed light on the true life of a chocolatier. This is what worries chocolatiers the most: the non-creative side of the business. Bureaucracy, marketing, forecasting orders, inventory, shipping. At Tomric, we can relate to these challenges. Having helped many chocolatiers overcome these very challenges to take their businesses to new heights, we’ve come to find that the answer is not always to work harder, but to work smarter. To do this the secret lies in the tools and resources you have as a chocolate maker. Chocolate makers need solutions that are versatile, easy to use, and above all else allow them to do two things, Automatically temper chocolate and keep it tempered all day long. Selmi’s line of tempering equipment does just that. It’s the reason why we’ve been partnering with them over the last ten years. 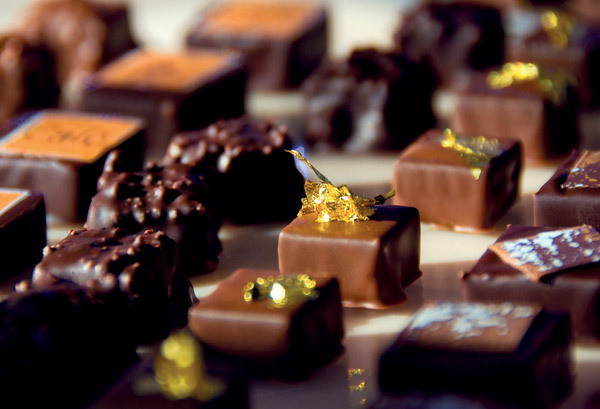 Their problem-solving approach to customer needs and focus on building machines that are innovative – and also intuitive – have made them widely regarded as the best chocolate equipment in the world. Part 1 – In this video, we are using the Selmi Plus EX Tempering Unit to dispense melted chocolate onto ganache squares running along the Selmi R200 Enrobing Unit. Part 2 – Selmi’s chocolate enrobing machines offer a precise, repetitive process that ensures an end product with a consistent weight and thickness. This video displays who you can adjust a Selmi enrobing unit. Want to learn more about Selmi Equipment and how you can add it to your current production? Our team will help you find what you need. Contact us or send us a message on our Facebook page and we’ll take it from there!